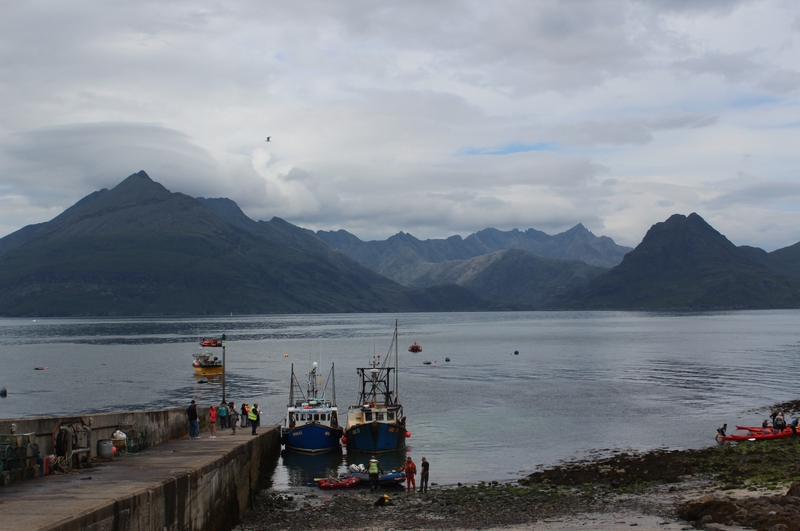 Today we drove in our rental car along a series of nerve-racking single-track roads to the village of Elgol. 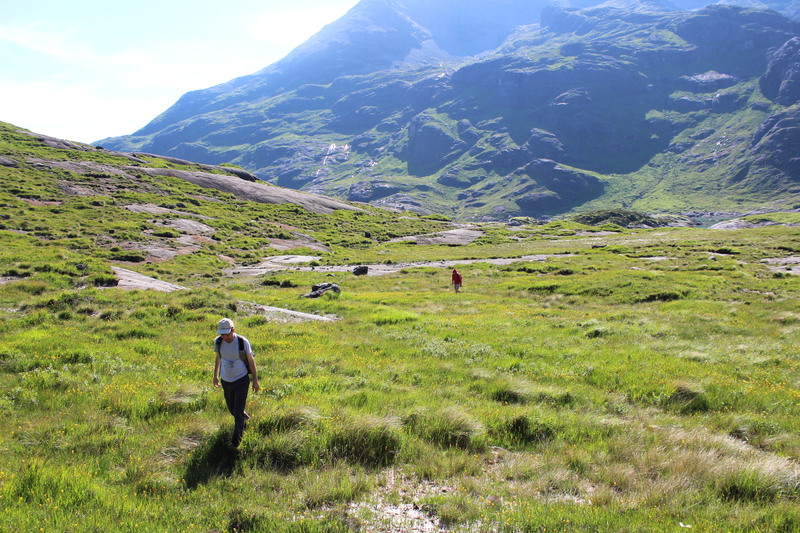 Our plan was to go on a hike described in my Rough Guide to Scottish Highlands and Islands. 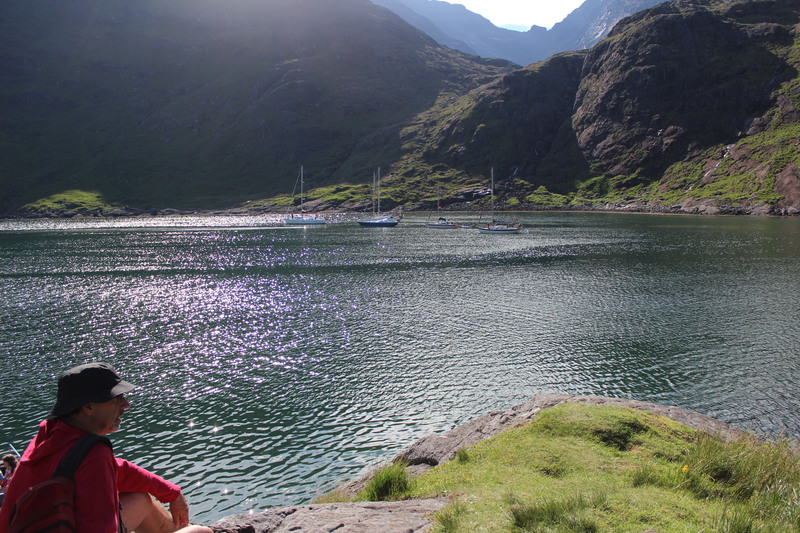 The idea is you take a small boat to the isolated Loch Coruisk, then hike along the coast back to Elgol. There is one catch to this, which the guidebook refers to and the boat operators post signs warning you about, complete with drawings and photos. 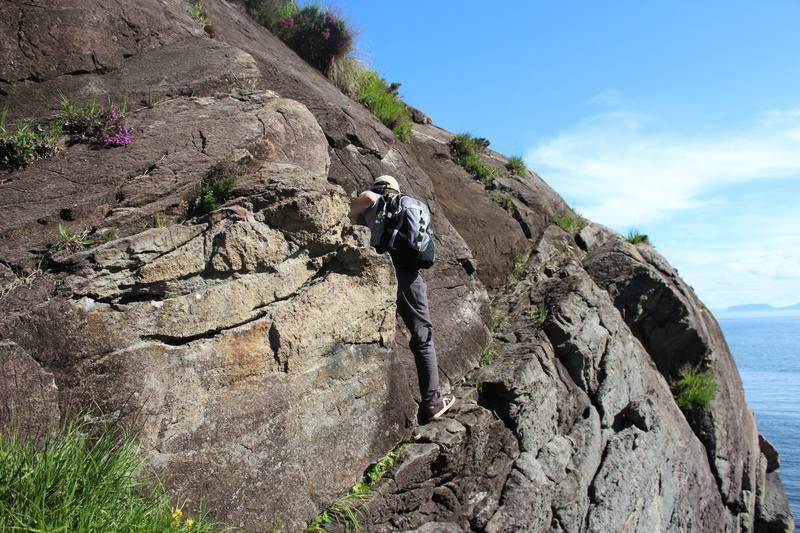 That is the Bad Step, a little bit of the trail that requires the hiker to edge along a section of rock 30 feet above the sea. Hah hah, we laughed. What ninnies these tourists are. We are the adventure travelers. No biggie. We took the boat past seal- and bird-inhabited rocks to the place where you can walk to Lake Coruisk. We explored the lake shore and had a little picnic. 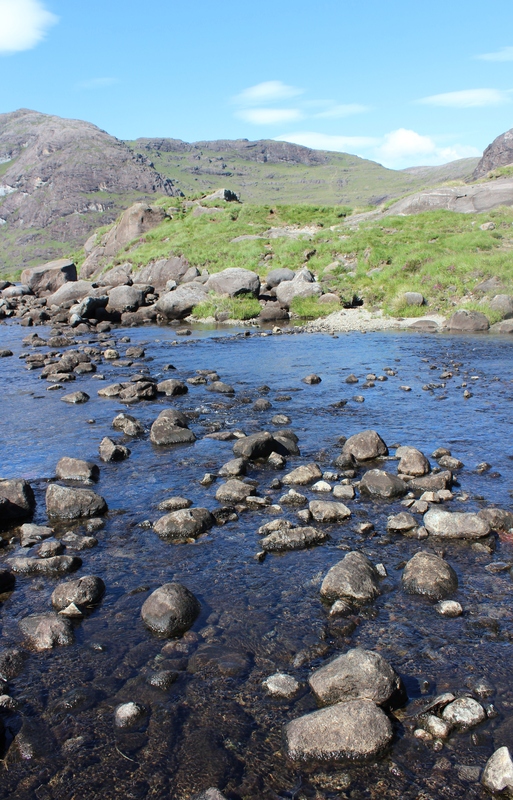 Then we set out on the trail to Elgol. We negotiated the “tricky river crossing” mentioned in the Rough Guide, easy-peasy. As we went on, the trail got a little vague, and there were some sections that involved four-legged scrambling. Still all do-able. Until… the Bad Step. Kosta went first. The step is out around a slight promontory in the rock, so we couldn’t actually see him from where we were. But we could hear the rising panic in his voice as he got partway around the narrow bit. There were a couple of tense moments when we wondered which of us was best qualified to attempt a rescue operation. Together we three decided this was not really something we wanted to do. Kosta edged his way back and we headed back the way we’d come. Of course, by now we had missed the boat back to Elgol (the boat full of all the cautious, smart people who know better than to go anywhere with the word Bad in it). We waited a while, and another boat came. It was too full to take us back but the captain said he’d ask his brother, who was bringing a boat full of French high school soccer players out for short look at the lake. Once again, the hapless foreigners are saved by nice Scottish people. Really, this place is the best. We rewarded ourselves with a delicious dinner of squat lobsters and tayberry cranachan. 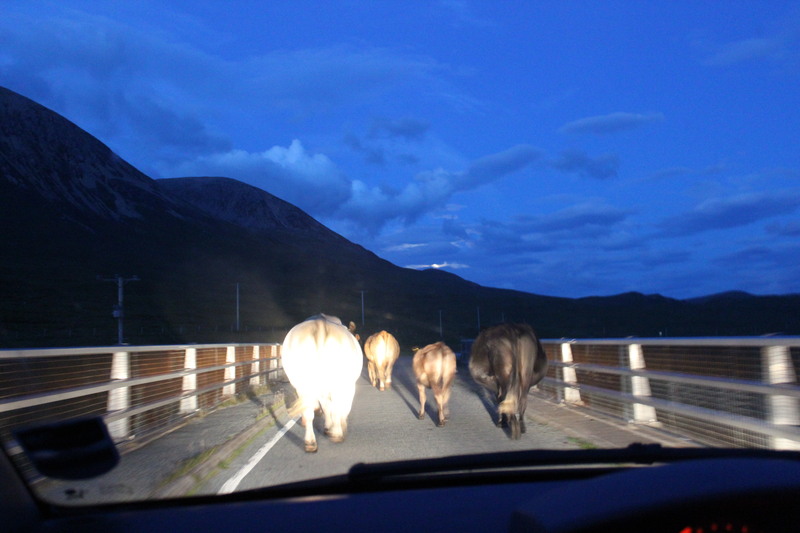 Then followed the cows home, slowly, along the single-track road. This entry was posted in Elsewhere, Islands and tagged Isle of Skye, Kosta, Scotland, United Kingdom, walking. Bookmark the permalink.